DRESS SHEETS come trimmed all around with any of our binding colors, a forward inside surcingle, front strap, and a macrame tailcord. Hand Braided Fancy Hips, Piping, Additional Front Strap or Leather Front Straps are available for an additional charge. 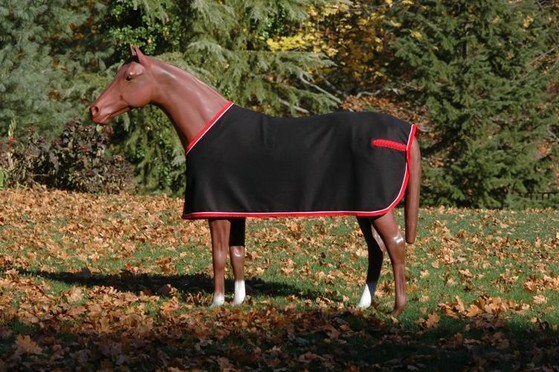 QUARTER SHEETS are used as a stylish and practical way of keeping a horse's vital organs warm during cold weather riding. They all come with a contoured rump, and macrame tailcord. The area underneath is reinforced with BAKER Blanket fabric to prevent premature wear. Please specify blanket size and style (Traditional or European) when ordering. Quarter Sheets are available in the following qualities: Peerless, Coolerfleece, BAKER Fleece Plaid.